Four RHS fall teams made postseason tournaments this year with the girls’ soccer team making quite a run. 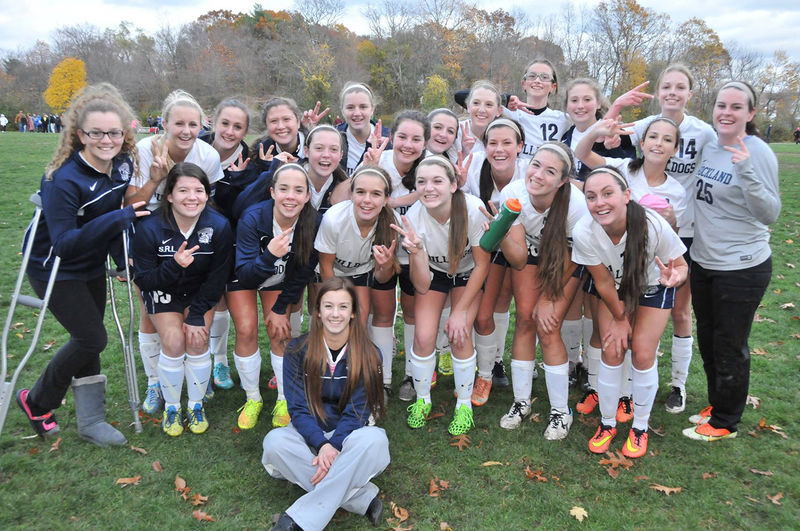 Entering the tournament, the girls’ soccer team felt cautiously optimistic. With a record of 10-5-3, they hoped to make it far into the tournament. Senior captain Julia Matson believed they were capable of that. First up for the girls was a game against Pope John from Hyannis. Traveling the long distance to the Cape did not bother the girls as they came away with a win, getting them a quarterfinal home game against Hull. This was a close game but Rockland controlled the play most of the way and came up with a 1-0 victory. Next it was on to Norwell High School in a semi-final match-up with league opponent, Carver. The teams had traded wins in the regular season and the game was also a close one but Rockland freshman, Grace Oliver scored two second period goals and Rockland found itself in the Division 4 South Sectional Finals for the first time since 1990. The girl’s season ended with a heartbreaking loss against their biggest rival, East Bridgewater on Sunday, 4-0. They played well and fought hard, but injury unfortunately played a role in the game’s outcome. Head coach, Gregory Rowe, is pleased with the season overall.